A key factor for the government in employment-based immigration decisions is ensuring that jobs remain at adequate levels for current U.S. residents, despite the fact that studies show immigration is good for the economy and actually creates jobs. Therefore, a requirement for many employers to be able to sponsor employees for nonimmigrant work visas or permanent residence is obtaining certification from the U.S. Department of Labor. Obtaining certification can be a complicated process, and an attorney can help properly prepare and smooth any issues that may arise. A lawyer can also help your company determine whether an alternative to labor certification might be available. 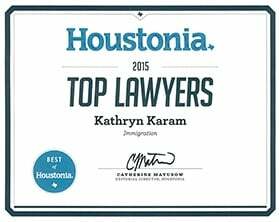 Kathryn Karam is a Houston immigration lawyer who can assist your business with obtaining labor certification or completing labor condition applications if you are seeking to bring talent from overseas to work at your company. Kathryn Karam is experienced with complicated employment-based immigration matters, and knows how to develop creative solutions to issues that may arise. Labor certification is often a necessary step to begin the immigration process for workers a company seeks to sponsor for immigrant and nonimmigrant visas. Call (832) 582-0620 today to set up a consultation with Karam Immigration law to discuss the certification process. Karam Immigration law assists businesses operating throughout the Houston area, including the Energy Corridor, Cypress, Spring, Tomball, The Woodlands and Sugar Land. Any person seeking to work in the United States who is not a citizen or permanent resident must obtain either an immigrant visa, if the position is permanent, or a nonimmigrant visa, if he or she aims only to work in the United States for a set period of time. The employer seeking to retain an employee for long-term employment must seek approval from the U.S. Department of Labor as a first step in the immigration process. The purpose of these approval processes is to ensure that new workers coming into any particular industry or field will not hurt the wages or working conditions of U.S. workers currently employed in that industry or field. For an employer to sponsor a potential employee for permanent resident, also called a "green card," it must obtain labor certification. For a person outside the United States to work at a permanent job in Houston, a green card is necessary. The rules surrounding labor certification are found in the Code of Federal Regulations, beginning at 20 CFR § 656.1. That the job is full-time and permanent. There are many other legal requirements involving notice and other aspects. An immigration attorney can help make sure all requirements are fulfilled before starting the process, which may save time and ensure the process is as smooth as possible. Labor certification is also required for many nonimmigrant visas. Not all employers and employees must go through labor certification. There are alternatives available to some. If the hiring the employee benefits the United States as a whole in an important way, the employer may seek a national interest waiver. To qualify, the hiring must meet the three prongs set in Matter of New York State Department of Transportation, 22 I&N Dec. 215 (Comm'r 1998), also called the "NYSDOT test." That the national benefits of the work outweigh the concerns of the labor certification process. You must provide documentation that the work meets these prongs. An attorney can help gather the appropriate documents and make your case. 20 CFR § 656.5 contains "Schedule A," which are professions and fields where labor certification is not required. Schedule A, Group I includes physical therapists and nurses. Schedule A, Group II includes people who work in the sciences, arts and performing arts and have exceptional ability. If you are a Gulf Coast employer who is seeking to bring talent from around the world to work for you, labor certification or completing a labor condition application may be an important first step. Houston immigration lawyer Kathryn Karam can assist to ensure the process goes as smoothly as possible. Call today at (832) 582-0620 to set up a consultation.